the artists formerly unknown as otterwechsel are back on the map. this ep collects 4 songs from 2003. filed under instrumental/post rock. very nice. March 20, 2009 | Filed under Releases and tagged with indie, instrumental rock, postrock. 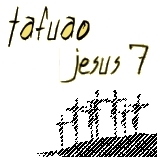 jesus 7 is still alive. Hammer. wie hast du denn hergefunden?